I think you’ll agree with me that there are many so-called unique and notable wedding rings on the market. These days, you can search online and find a ring that your neighbor or even your whole city probably won’t have. Honestly, style, metal choice and gems are all important factors in choosing your wedding ring, and it can be easy to be seduced by the sparkle. Yet, to truly find the uniquely perfect wedding ring for you and your partner requires looking below the surface. Consider, for a moment, that your wedding rings are more than likely the most symbolic piece of jewelry you will ever own. How do you capture those feelings in every part of the ring? From where it was sourced in the ground, to who made it and the jeweler who then sells to you? What I suggest here is that your wedding ring choice should represent your matchless loving relationship through design, symbolism, and how the rings are made and sourced. Once you’re through this article, you may have a different perspective on wedding rings entirely. 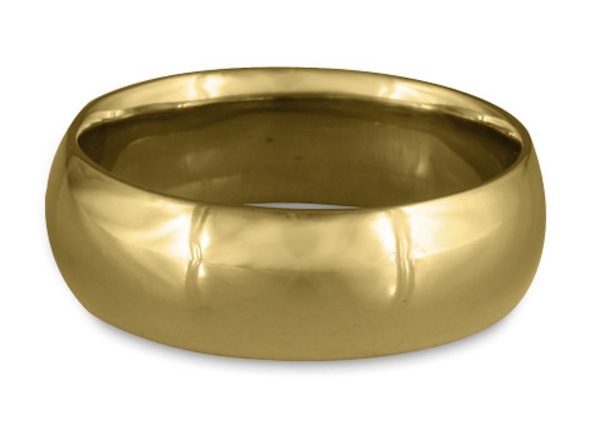 yellow gold make this a truly unique wedding ring. The first wedding rings were made from braided hemp, which were exchanged six thousand years ago by the Egyptians. They wore the ring on the left ring finger, as we do today, which was believed to be directly connected to the heart through the Vena amoris, the love vein. These days, it is rare to see a selection of rings that are not mass-produced, like plastic cups or utensils. In fact, a huge number of wedding rings found while browsing all the jewelry cases, particularly in the mass markets, are factory made in China with unethical dirty gold. We live in a world in which everything, even the data around our friendships, has become a commodity. I think that the trend toward uniqueness is a reaction against this. If you agree with this point then the criteria for uniqueness is simple: the important elements of your wedding rings is style, fabrication and sourcing. But, what is not to be forgotten is that your story and your uniqueness is what tie these elements together. We’ll start with style, showing how even the most traditional looking wedding ring can be entirely unique. Surprisingly, this wedding band might be the most remarkable wedding band you can find. 2. A Remarkable Wedding Ring Can Definitely Appear Traditional, But Alas! Is not. Here’s the bottom line: a unique wedding band can look like any other wedding band, but the stories of how it is made may be what's remarkable about the ring. In other words, a wedding band does not have to appear extraordinary to be extraordinary. Here are a few great examples of wedding rings that appear traditional, but really are incomparable. The first is from Greg Valerio, who started the entire Fairtrade gold movement through his travels down to the Chaco region of Columbia, back in 2002. The people there were mining alluvial gold using only water. Areas that were mined were filled back and farmed. This gold was 100% eco and it provided an actual living for their community. Zero collateral damage from mining? Amazing, simply amazing. From this gold he made some very simple or more plain wedding bands, similar to the one shown above. These rings have an amazing story about connecting to a source that turned out to be the beginning of the international Fairtrade gold movement. These days, even simple Fairtrade gold wedding bands, as I will explain in point 5, can have an incredible story of their own. A second example of a matchless and exclusive-to-you wedding ring has to do with the meaning or the story behind the ring because of who has worn it over time. Suppose that you are given your father or mother’s wedding band worn for over fifty years. And, that same ring was worn by your grandparents. 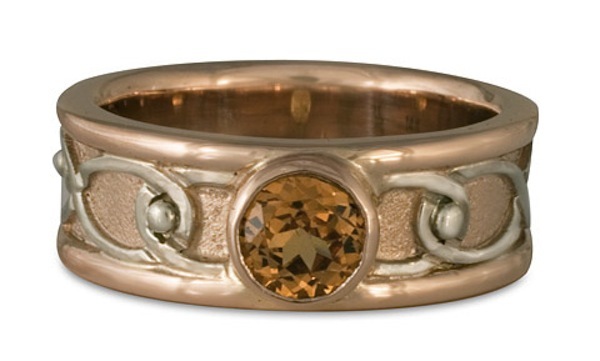 This completely one of a kind wedding ring carries the family lineage and has irreplaceable value. Wearing this kind of ring can help to remind you who you are and where you come from. Both these examples illustrate how the value of wedding rings is determined by what they hold symbolically. In both these cases, it is the connection to story that makes a wedding ring truly irreplaceable. This custom handmade engagement ring was designed, in collaboration, with the groom to be and one of our skilled jewelers. Moving beyond the traditional wedding ring style, you have infinite possibilities to create a wedding ring that symbolizes a particular quality or an inspiring image derived directly from you. 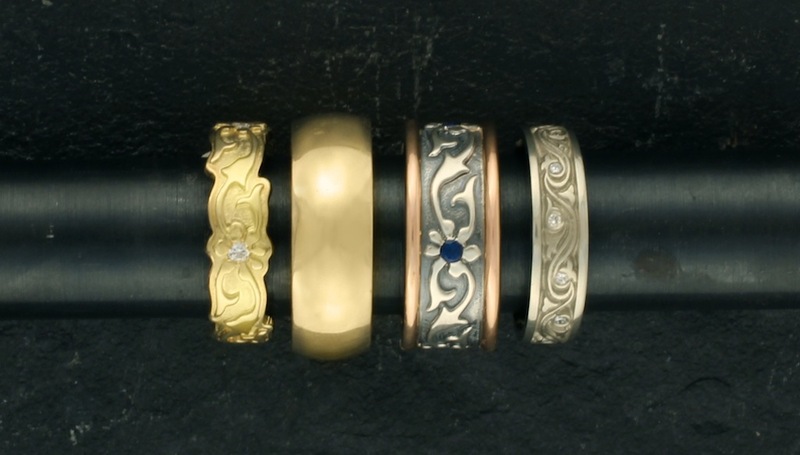 The surfaces of wedding bands are actually a canvas upon which a creative and skilled jeweler can create a design. The question is, what design upon your wedding ring would express you and your partner’s relationship and love? Maybe you stare into the night sky with the thought, what is beyond the stars and beyond the great sky? Perhaps a wedding ring inspired by Van Gogh’s masterpiece, the Starry Night, might be the perfect and inspiring choice. Another possible idea… a wedding ring can represent essential qualities of a partnership while simultaneously expressing deep personal and cultural traditions, like the Zen Garden wedding ring. In the Celtic arches wedding ring the two lines that create the intricate knot work around the band represent the coming together of two individual lives. The individual pathways merge in unity, arching up from Earth to the heavens and back, representing the emergence of dynamic creativity from the heavens and the earth. Another idea: suppose you and your lover enjoy a good frolic… in the ocean. Waves and water have symbolic associations with birth, fertility, the dream world, the Goddess, emotions and creation itself. If this resonates with you, the perfect wedding ring might be the wind and waves wedding ring. One further idea: make the ring entirely your own. What's the story you want to tell through your wedding rings? Bring your idea to a jeweler who can design with you and make a custom wedding ring. In this perfect scenario, your unique wedding rings can be made completely of your own original and truly incomparable design. 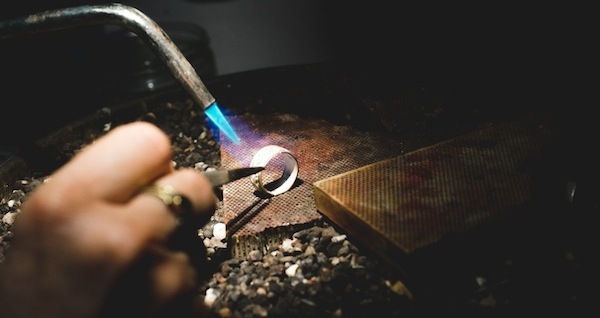 Our Lead Designer creating a custom wedding ring for a customer, using her torch to set the different metals. 4. Fabrication of Unique Wedding Rings: Who Are The Makers? If you really want a wedding ring that's a significant talismanic expression of your love, then how a ring is made could probably be just as important to you as well. These days, wedding rings, even so called “unique" wedding rings are mass-produced through die striking or CADCAM. In the former example, wedding rings are created when one piece of steel “strikes” metal with fifty tons of pressure into a mold. With CADCAM programming, an image of a ring is designed on a computer screen and emailed to a 3-D modeling machine. The ring design is then endlessly reproduced in a repetitive casting process. Not very remarkable. You can bypass this soulless process and have your wedding ring wax carved, by hand, from a jeweler who has dedicated his or her life to creating exquisite individualized miniature sculptures of art. The enduring relationship between artist and material is reflected within the ring itself, which has an entirely different feeling than a ring that is manufactured by machine. This high level of artistry becomes part of the story of your irreplacable wedding ring. 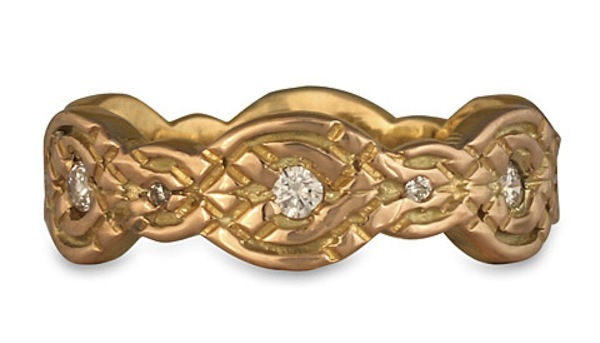 For example, this Arroyo Luminoso wedding ring was created by Michelangelo Stanchi, a jeweler from a multigenerational family of Italian jewelers. He first carves his rings in wax, then from that a mold is created for one-at-a-time castings. From there, gemstones are handset into the ring, which is then polished to utter perfection. Alternatively, you can choose an exclusive wedding ring that is handmade individually and entirely from raw sheet metal and metal wire, such as in these two tone wedding rings. Here, the metal is shaped, formed and hammered by hand, following a jewelry creation technique that originated with the Spanish Conquistadors hundreds of years ago. This level of skill requires decades of careful designer jewellery experience. Even if the design is well established or even relatively common or popular, every handmade wedding ring is a inimitable wedding ring because no two are ever going to be the same. children and families a future filled with oportunities. Now that we’ve touched upon how a ring is made, the final part of having a notable wedding ring is to consider the story of how your ring’s components will be sourced. If you are concerned about environmental and social justice, find the kind of designer wedding rings that align with your values. These days, some jewelers are saying that recycled gold is an eco-friendly choice that prevents additional mining. Unfortunately this is not true. No matter how much recycled gold is used, it does not prevent mining from happening, and/or the child labor, destruction of the environment, or the dangerously heavy use of mercury associated with mining. In truth, using recycled metals actually sidesteps these issues because the metal supply house becomes the source of the metal, not an ethical mine. If you want a more detailed picture on this issue, feel free to read my companion article: 15 Reasons Why You Should Buy Fair Trade Gold Jewelry Over Recycled Jewelry. Here’s the truth of the matter. Mining can be classified into two broad categories: large and small. Large-scale mining is about the politics of greed. We do not need any more gold from large mines. Small-scale mining is about the politics of bread. Let’s consider them for a minute. Their lives are characterized by high levels of poverty, marginalization and exploitation. The unskilled use of mercury poses a severe risk to the health of the miners, their communities and their environment. 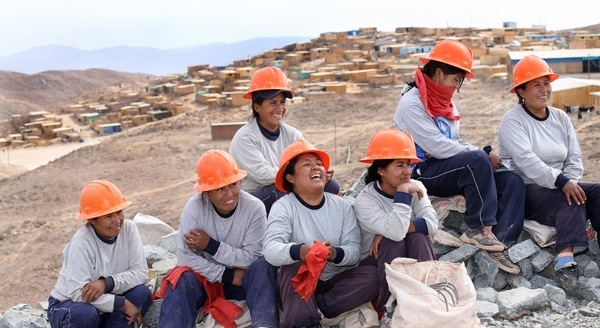 Working with Fairtrade International, miners meet strict standards: working conditions, child labor, women's rights, health, safety and responsible environmental management. In addition, the miners are able to gain market access international market pricing and receive $2000 per kilo of gold as a premium to invest back into their community and business. Jewelers are independently audited by Fairtrade International to assure that their use of Fairtrade gold is tracked and traced. These days, with so much at stake in the environment, choosing Fairtrade gold makes a real difference in the world. And perhaps more than any other choice or element, choosing Fairtrade makes your wedding rings truly and awesomely unique.